The Tudor Black Bay is one of the most successful and popular collections from the Genevan watch manufacturer. Harmonious retro designs and precise technology characterize this line. Top models are made of bronze and contain in-house movements. The Tudor Black Bay from the Heritage retro watch collection is one of the Swiss luxury watch manufacturer's flagship models. The Genevan company introduced the Black Bay diving watch in 2012 and continues to expand the line with new models. The vintage look is inspired by historic Tudor Submariner models, which is why new models are characterized by domed crystal and a large crown with no protector. The so-called "snowflake hands" with squared ends are another distinctive feature of this series. 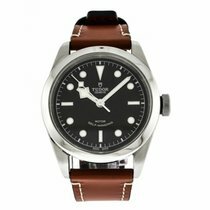 Tudor has been outfitting almost every Black Bay model with in-house movements since 2016. These movements have an impressive 70-hour power reserve and a certificate from the Official Swiss Chronometer Testing Institute (COSC). One of the highlights is the Black Bay Chrono, which was presented at Baselworld in 2017. This column-wheel chronograph with an in-house movement is a certified chronometer and can run for almost three days when fully wound. The bronze Black Bay Bronze and the bicolor Black Bay S&G in stainless steel and yellow gold are both in line with current trends. Those who like to change their watch's band will enjoy the additional textile strap that is a part of every complete Black Bay set. 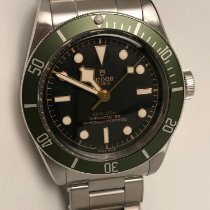 How much does a Tudor Black Bay cost? Prices for a new Tudor Black Bay range from around 1,900 to 6,500 euros. 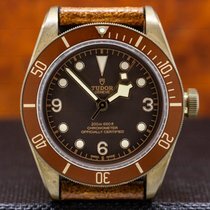 At the top end of this price range are models such as the Black Bay Bronze, which Tudor launched exclusively for the watch and jewelry company Bucherer. The Black Bay 36, on the other hand, sits at the lower end of the price range. This retro watch has a polished bezel that is reminiscent of the Rolex Explorer and thus is not a diving watch. The ETA caliber 2824 ticks inside this sports watch. The 41-mm variant is only slightly more expensive and is powered by the same movement. There are numerous current versions of the retro diving watch Tudor Black Bay. The first model came to market in 2012 and has a red bezel. The Black Bay Blue with a blue bezel appeared two years later, followed by the long-desired Black Bay Black with a black bezel in 2015. The year 2016 saw the release of the Bronze with an aluminum bronze case and the Dark with a stainless steel case and bracelet both coated in black. Since 2017, a bicolor version, the Black Bay S&G, and the Black Bay Steel with a stainless steel bezel have been released. Each variant comes with a stainless steel or leather band. You can change your band at any time thanks to the additional textile strap delivered with every watch. You can find a pre-owned Tudor Black Bay with a leather strap for as little as 2,200 euros; new models start around 2,400 euros. Set aside another 200 euros for a variant with a stainless steel bracelet in mint condition. One of the newer models with the in-house movement MT5602 without a date display costs about 2,600 euros. If you would like a watch with a date display, you should consider the Black Bay Steel or the bicolor S&G model. The latter costs around 2,800 euros for a new watch with a distressed leather armband, while the price for a model with a bicolor stainless steel and gold bracelet is around 3,700 euros. A new Steel with a stainless steel bezel comes in at 2,600 euros with a leather strap or 2,900 euros with a stainless steel bracelet. The bronze and all-black versions of the Tudor Black Bay line are among its most trendy models. The Genevan manufacturer uses the PVD (Physical Vapor Deposition) process to layer the stainless steel case and bracelet of the Black Bay Dark in black. Its appearance is both sporty and restrained at the same time. This timepiece costs around 3,400 euros with a metal bracelet and around 3,200 with a leather strap. Tudor's bronze watch is available as a standard model with a brown leather strap and an additional dual-colored textile strap. The 43-mm aluminum bronze case is completely satin-brushed. Over time this material will develop a distinctive patina, bringing to mind historic diving equipment and ship parts. You can purchase a Black Bay Bronze for a little as 3,200 euros. A highlight within this series is the Tudor Black Bay Chrono, an automatic chronograph with two subdials and a date display. The manufacturer launched this watch with stopwatch functionality in 2017 and equipped it with the caliber MT5813, which has a 70-hour power reserve. The chronograph operates using a column wheel, which is seen as being higher end and more prestigious than the alternative cam actuated chronograph. The latter is used in the widespread Valjoux 7750, among others. The MT5813 is based on the Breitling B01 that is used in current versions of the Navitimer. In return, Tudor provides Breitling with their own in-house automatic movement MT5612 with three hands. Furthermore, the Rolex daughter company modifies the B01 by using their own winding rotor to wind the movement when worn as well as a silicon balance spring for more precise timekeeping. Thanks to the screw-down crown, pushers, and case back, the Tudor Black Bay Chrono is water resistant to 200 m (20 bar). The manufacturer chose to make the inscription of the water resistance red in the style of historic diving watches. A tachymeter scale on the fixed bezel can be used to measure speed. You can measure periods of time up to 45 minutes using the subdial at 3 o'clock. That being said, the snowflake hour hand obscures part of this display when it's between 2 and 4 o'clock. The small seconds dial sits at 9 o'clock, while the date is at 6. Like other models from the Heritage Black Bay series, the chronograph is available with a stainless steel or leather band and comes with an additional textile strap. The version with brown leather costs around 3,600 euros, and the one with a riveted stainless steel bracelet costs around 3,900 euros. For comparison: you would have to pay at least 5,000 euros for a mint-condition Navitimer 01 that uses the same base caliber. Those on the lookout for a more elegant sports watch should take a closer look at the Tudor Black Bay 41 or 36. As their names imply, these two models differ in their case sizes. They feel a bit more formal than the diving watches and chronographs due to their polished, fixed bezel. Thanks to a water resistance of 150 m (15 bar), you can keep the Black Bay 41 or 36 on while swimming. The caliber 2824 ticks away inside these watches rather than an in-house movement. This movement has a power reserve of 38 hours. As for the band, you once again have the choice between stainless steel and numerous leather bands. You can get a 36-mm model in mint condition for less than 2,000, regardless of the band. The 41-mm version costs only slightly more at around 2,200 euros. 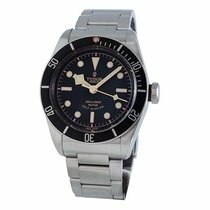 How can I know if my Tudor Black Bay has an in-house movement? If you want to know if an in-house movement is ticking inside your favorite Tudor Black Bay , take a look at the dial. Models with in-house movements have the inscription "Chronometer officially certified" above the 6 o'clock position and below the water resistance. Watches from before 2016 feature the inscription "Rotor Self-Winding" instead. It's easy if you have a Black Bay S&G, Steel, Chrono, Dark, or Bronze since these variants have always been made with in-house movements.